Know Your Farmer, Know Your Food. Every family needs a farmer. Photo: Virtual Panorama of Reiter Berry Farms, in Watsonville, CA. KYF2 Month is soon coming to a close. However, we still have a few announcements up our sleeves. 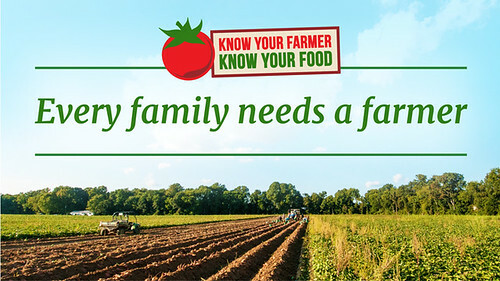 Today we’re rolling out the revamped Know Your Farmer, Know Your Food website. The site was redesigned to offer a more user-friendly experience that makes it easier to navigate the wealth of USDA and partner resources. Using updated web standards and visuals to optimize the user-experience, we’ve reorganized the information and gathered new content. In short, the KYF2 website has become an even better a one-stop-shop for information on USDA’s local and regional food systems work. Having led the KYF2 Initiative prior to my role as AMS Administrator, I am astounded by its evolution, and the KYF2 website is evidence of that. We began by listing only a handful of USDA resources, but the number of USDA activities that we either launched as new or utilized in their current form has grown exponentially since 2009. In addition to information on technical assistance and funding opportunities, the website is organized by “role” in the local and regional food system. For instance, if you work for a food hub, there are sections just for you such as, “Processing and Aggregation”, and another on “Distribution”. Another exciting development is the addition of an Urban Agriculture section, highlighting the new face of agriculture in urban communities. As I mentioned earlier, we still have a few announcements we’re working up before the month is over, and along those lines, we’ll have an important new development to announce on Urban Agriculture later this month. An important holdover from the previous KYF2 website is the KYF2 Compass, where you can find USDA local and regional food system investments in your community, and beyond. The compass is currently undergoing an upgrade, and we look forward to including even more information soon. The KYF2 Initiative showcases how USDA supports local and regional food systems across the entire supply chain with funding, technical assistance, and more. We hope you will find this beautiful new website dynamic and intuitive, and will use it to identify resources to continue the important work of small- and mid-sized producers, food entrepreneurs, and others in your community. Please visit the USDA New Farmers webpage and the Discovery Tool. The Discovery Tool allows new farmers, including first time farmers, women, youth and veterans, to build a personalized set of recommendations of USDA programs and services that may meet your needs.